Bill Smith, Editor, ARRA News Service: Today, I take liberty to digress for this post from politics of the day. I wish to pay tribute to the passing of Harry J. Hillaker. He is known to many as the "Father of the F-16." He affected and still affects the lives of millions of people including mine. As a young officer, I was assigned to provide support to a F-105 Fighter Wing, the "Flying Tigers." Setting aside the heroics of the men who flew these war horses to take out SAM sites in Vietnam, I became interested in both the design and support of the plane. A few years later, while graduate student at the Air Force Institute of Technology (AFIT), I teamed up with another officer, Eric Nelson, to investigate the factors that drive the costs associated with maintaining fighter aircraft and to improve the methodology of forecasting the cost to support emerging fighter aircraft. We developed a taxonomy of characteristics and a theoretical model. We were challenged to prove the effectiveness of our model and were granted access to the flight and maintenance history of all prior "fighter" aircraft and one of the Air Forces top computers systems. We tested our model against the past history of prior fighter aircraft data. Our taxonomy of characteristics proved to be valuable in greatly advancing the the forecasting cost for all aircraft investment spares. Our research was tracked by numerous government agencies and prior to its publication, we briefed the Air Staff at the Pentagon on our research was released to the public as A Taxonomy of Cost Estimating Characteristics as Applied to an Aircraft Replenishment Spares Model. Although I was a newly promoted Captain, with the attention given to our research, I had hoped to be assigned to the Air Force Systems Command to work on the development and acquisition of new fighter aircraft. However, the Air Force had other plans for me for the next several years. But, fate still smiled. In my 19th year, I forecast my desire to retire at twenty years but was denied my retirement request. 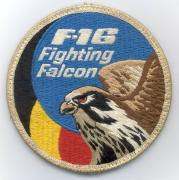 Instead, I was assigned to the Air Force Systems Command not as a project officer or a stateside office, but as the Director of the $2 Billion European F-16 Co-production Program headquartered in Brussels with 35 plants in four European countries. The F-16 aircraft design was originally jointly owned by five countries, the United States, Belgium, Denmark, The Netherlands and Norway. I met and worked with the finest people in the aircraft industry from all five countries to achieve our goal of manufacturing, assembly, flight testing and delivering F-16 aircraft. As a senior engineer at General Dynamics' Fort Worth aircraft plant in the 1960s, Mr. Hillaker led a design team that worked, secretively at first, with a small group of Pentagon insurgents to turn a collection of ideas, theories and concepts into what would become the F-16. Their success is evident in that four decades later, the plant, now part of Lockheed Martin, is still producing F-16s. More than 4,400 have been built and delivered worldwide. At the peak of production in the 1980s, close to 25,000 people were working on the program. "Harry's legacy is an incredible aircraft that has become the mainstay of 25 nations and continues to be in demand today after 30 years of production," said Ralph Heath, president of Lockheed Martin Aeronautics Co. "The early F-16 versions paved the way for tens of thousands of jobs, over $100 billion in sales and customer relationships that are the cornerstone for Lockheed Martin's transition to the future with our new aircraft programs." Tags: Bill Smith, F-16, fighter aircraft, Harry Hillaker, tribute To share or post to your site, click on "Post Link". Please mention / link to the ARRA News Service. Thanks!